The Elite ShieldAll™ Car Cover provides superior protection against all weather conditions but focuses on very hot and sunny climates. The material is a special woven polyester fabric coated with a thick, silver reflective urethane layer on the outside and a soft inner lining thats add's some bulk to help pamper a vehicles fine finish. It will not only keep your car cooler but preserve the interior and paint job from fading. These covers have durable double stitched seams for maximum durability. Elastisized front and rear hems. Preinstalled grommets on the left and right side to help keep the cover in place during high winds. It also comes with a free storage bag and a 2 year limited warranty. Suggested retail price: $149.99 and up. 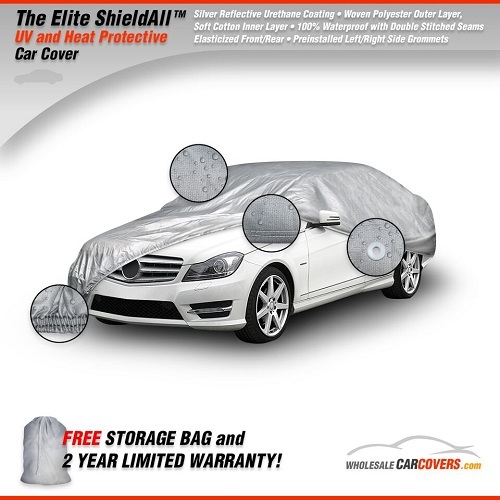 The Elite ShieldAll™ Car Cover provides superior protection against all weather conditions but focuses on very hot and sunny climates. The material is a special woven polyester fabric coated with a thick, silver reflective urethane layer on the outside and a soft inner lining thats add's some bulk to help pamper a vehicles fine finish. It will not only keep your car cooler but preserve the interior and paint job from fading. These covers have durable double stitched seams for maximum durability. Elastisized front and rear hems. Preinstalled grommets on the left and right side to help keep the cover in place during high winds. It also comes with a free storage bag and a 2 year limited warranty. Suggested retail price: $124.99 and up. ESA-1 - Elite ShieldAll Cover fits cars up to 13'1"
ESA-2 - Elite ShieldAll Cover fits cars up to 14'3"
This Elite ShieldAll™ Car Cover is specailly designed for Corvettes and low profile cars alike up to 15' long. It provides superior protection against all weather conditions but focuses on very hot and sunny climates. The material is a special woven polyester fabric coated with a thick, silver reflective urethane layer on the outside and a soft inner lining thats add's some bulk to help pamper a vehicles fine finish. It will not only keep your car cooler but preserve the interior and paint job from fading. These covers have durable double stitched seams for maximum durability. Elastisized front and rear hems. Preinstalled grommets on the left and right side to help keep the cover in place during high winds. It also comes with a free storage bag and a 2 year limited warranty. Suggested retail price: $124.99 and up. ESA-4 - Elite ShieldAll Cover fits cars up to 16'5"
ESA-5 - Elite ShieldAll Cover fits cars up to 17'8"